George Stephen………..Many people have heard the name…….and many know that he is the inventor of the Weber kettle, and that he is the founder of Weber-Stephen Products LLC, the industry leader in the manufacturing of barbecue grills, but there is so much more to the man behind the legacy. Although he became the sole owner of a very successful business, he still kept the friendships of all of the friends and neighbors he ever knew. He remained grounded and never put on any airs of grandeur wealth. He was always the life of the party, and wanted everyone to share in the party. He often invited friends and acquaintances to family events, and no matter how large the group, he somehow managed to spend time with every person there, including the children, and left everyone feeling like a million bucks! He never wanted the spotlight to be on him. He preferred to spotlight the people around him in the company who made it all work. George was a man who was generally seen dressed very casually, even at the office. A Hawaiian shirt, shorts, and a briefcase were common. Rarely would you catch him dressed in formal attire. He encouraged this same manner of dress at work, at all levels. After all, we were selling a product for casual get-togethers, so the office should be casual as well. 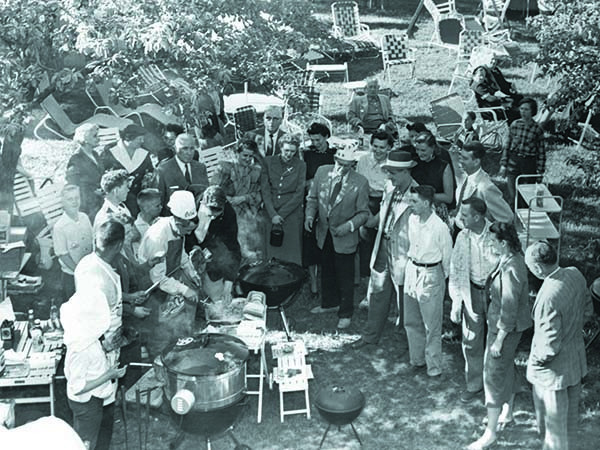 He wanted an atmosphere of being at a backyard barbecue. He had 12 children and many grandchildren and he saw his employees as his extended family, and assured his company took care of them. He not only knew everyone by name, but also knew and remembered their families. Being a “seasonal” business back in the day, rather than lay them off, George would find work for his employees in the off-season. He often invited employees to go with him on his many “big boy toys”, such as his plane, his boats or his motorhome. He instilled and expected loyalty and earned it, but paid it back in many ways. People who came to work at Weber, stayed at Weber. George was a great role model to his children and grandchildren, and loved being around them, taking them to the circus and many other fun activities, and buying them anything they wanted. No vendor could pass by him, without him buying whatever they were selling for each of his children or grandchildren. He was a kid at heart, and enjoyed doing things with all of them. He enjoyed skiing, golfing, boating and any adventure that meant fun. He was known by his community as being big-hearted, and a generous contributor - usually quietly - never wanting to call attention to himself. He readily supported charity, with his favorite being the Merillac House in Chicago. He began a tradition of hosting a Christmas party for the children of Merillac, often inviting Bears, Bulls and White Sox players to the party, with Weber employees volunteering to make it the best party ever. This tradition continues today. While most would be happy with having one great invention, George was always inventing and trying new things…a true American entrepreneur. He loved sailing, and traveled around the world, finding items that could be used in his barbecue business, as well as his other inventions. The office was often decorated with photos from his many trips. He was very intelligent and skilled in the mechanics and fabrication of metal bending, with a great eye for design. He could be away for weeks, yet had the pulse of the business the minute he got back. He could tell by the sound if a bearing or belt on a press wasn’t right. A genius – he could envision things others had not thought of, and would make one pause and think. And he was a natural-born salesman. He carried his kettles to various locations to demonstrate them himself in hopes of selling his idea. 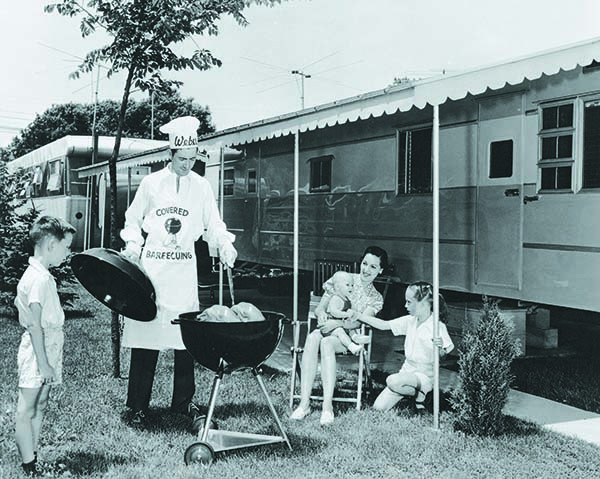 He only wanted to sell quality products…..that the Weber name stood for the best you could get. He loved to talk about the magic of the product. Most have described him as “larger than life”. There was amazing depth to the man. He had a definite presence in the office, yet was very approachable. He had an endless amount of love for life and all it held. I came to Weber a few years too late to know him myself, but the legend lives on……just ask anyone.